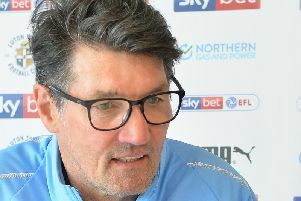 Hatters boss Mick Harford didn't think he needed to change things any earlier during yesterday’s 1-1 draw with Coventry at Kenilworth Road. Although Luton were slightly below par for the second half of the first period, Harford opted to keep things as they were, replacing George Moncur with Elliot Lee on 65 minutes. He then brought on Kazenga LuaLua with 12to go for Danny Hylton, leaving the likes of Jason Cummings and George Thorne on the bench. When asked if he felt he could have made the switches beforehand, Harford said: “Not really, we know George is not up to full speed, so we knew Elliot would come in there, and is a great replacement to come on. “I thought Danny did well, Danny played well, it was just a matter of getting fresh legs on there, bringing Kaz on to try and open something up in a condensed 18-yard box. “You’re never going to bring your top goalscorer (James Collins) off, he’s on fire in terms of goals this season. “We thought about changing shape, but we were dominating throughout the second half, so we thought why change? "Just keep at it and hopefully something will break for us, unfortunately it didn’t, but we’re happy with the performance. With Town having bolstered in the transfer window, it meant that Harry Cornick, Elliot Lee and Alex Baptiste all missed out on the squad completely, as Harford admitted they were the hardest decisions to make. He added: "It’s tough, it’s the toughest part of the job for me at the moment, I don’t like it, leaving players in the stands. "We made a couple of changes, Elliot came in, he’s back to fitness near enough, he came on for George, who, it was a really warm day and maybe a little bit of fatigue in George as he hasn’t played a lot of football of late. "With Kaz, we knew that they would sit deep, we knew they would drop off and make it hard for us and we just thought Kaz could come up with a big of magic. “It just never fell for us though, we tried and we created all kinds of opportunities, but the ball just never dropped for us."